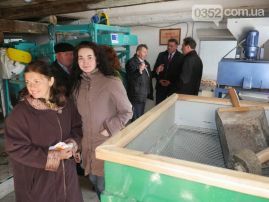 One more agricultural service cooperative was developed in Ternopil region in village Tseniv, Kozivsky rayon. With the EU/UNDP CBA Project support local community procured agricultural processing equipment: mill, extruder, peeling mill, oil mill, skim and other. More than 180 villagers already became members of the cooperative "Stary Mlyn" and will recieve agroprocessing services for lower than usual marketing price. The total cost of the procured equipment is UAH 852 ths., out of which EU/UNDP provided UAH 677 ths. The rest money were provided by members of cooperative, local authorities and private sponsors. The cooperative "Stary Mlyn" was not built in one day. Villagers faced different challanges on their way: it was not easy to find and procure comprehensive equipment for a good price, installation of the equipment was not easy, but community overcame all these obstacles. A big number of memebrs of the cooperative shows the power of integrity.